We know how to party here at IHAN. We started the day with Zach jammin on Aaron's guitar. Then he moved over to a little percussion. Move over Antonio Bandares.....Zach is moving in!! Here at IHAN midnight gets celebrated at 9pm. First we have to have some hors d'oeuvres IHAN style!! 10, 9, 8, 7, 6, 5, 4, 3, 2, 1.....HAPPY NEW YEAR!!! Oh yea....forgot to mention the Party Poppers that went on inside after the big Pot Banging Par-tay!!! That is our big New Years Eve!!! I hope all of you have either had or will have a wonderful New Years Eve. 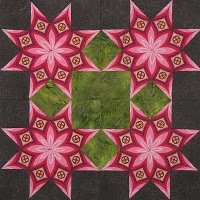 Electric Quilt 6....DO EQ? I DO NOW!!!!! IHAN sells EQ6 and I have always wanted the EQ6 Software. 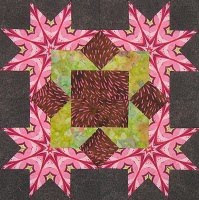 You can imagine how excited I was when I learned I had won the software on Darlene's Blog, SewCalGal. I am so excited to get this software downloaded and start a project....or even just start poking around. I get to join the EQ Club now and start seeing what everyone else has been doing. If I forget to post in the next few days....someone needs to call me. This could be seriously dangerous.....I get could get lost in EQ Land for days at a time!!! Not only did I add the JanetBaskets (yes it is spelled correctly :) but I also added a few of my other favorites as well. 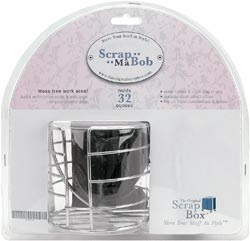 This is a Scrap-Ma-Bob Cup & Bag Clamp-On Holder. Prevent spilled drinks and eliminate clutter on your craft or sewing table. Durable steal holder attaches to the edge of most flat surfaces and is designed to hold a drink and reusable trash bag (included). Holds 32 ounce drinks. 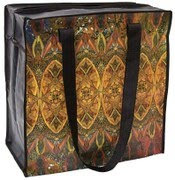 This is the Kaleidoscope Tote Designed by Paula Nadelstern. I thought this tote would never arrive. I think I waited 5 months or maybe longer to get this beautiful tote at IHAN. It was on back order at every distributor I use for months. It was designed by Paula Nadelstern. No wonder the tote caught my eye so quickly. I guess I know what I like when I see it....even when I don't remember the designers name. 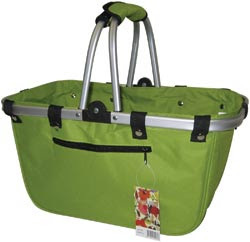 This amazingly lightweight tote features aluminum exterior structure and is completely collapsible. 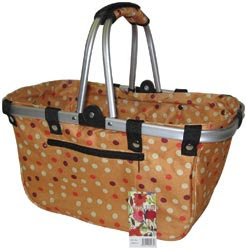 Originally designed as a market tote, it is also a super versatile project tote. The metal structure keeps access to goods inside immediate. 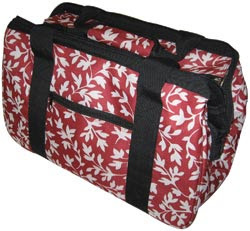 Made of durable nylon in great prints; self-fabric lined. Excellent quality. Exterior pocket. The EcoBag is potentially the ultimate project tote. 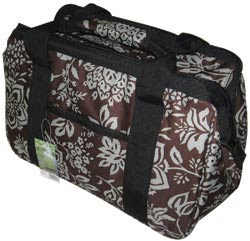 The extended zipper opens down the width of the bag for easy access to entire bag interior. 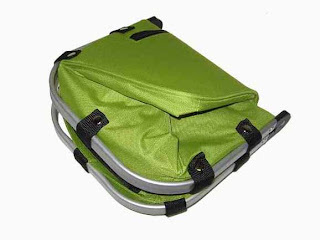 Large pockets line the interior sides of the bag. Bags are lined in coordinating solid nylon fabric. Bag bottoms feature large rubber mat corners. Handles are just long enough to slip to a shoulder. 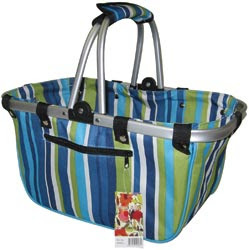 The feature we like best is that the zippered edges have metal support so the bag keeps its shape when reaching inside and doesn't droop when carried! I really like the JanetBaskets I bought for myself. 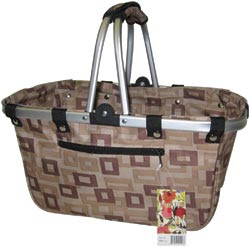 They are very well made and are excellent for projects, shopping, organization and errand running too. I bought them to hold things here on my desk. I typically have a pile of papers or mail that I don't have time to sort. Sometimes I have products that need to go downstairs etc. I just put everything into my JanetBasket and I'm ready to go downstairs or to my file cabinet. No longer am I dropping everything everywhere because I have it stacked 18 inches high in my hands. I also carry one when I run errands. Everyone smiles when they see it and ask me where I got it. Of course I just have to tell them....I got it at "I Have A Notion." I personally guarantee you won't be disappointed in any of these products. I own them myself and as most of you know....I don't waste my money!!! Don't you just love this coat? Rosemary (on the right) bought it for Sarah, her daughter, for Christmas. I'm in love with Sarah's coat. I think it looks so great on her. She even has this wonderful purple hat she wears with it. Oh geez....talk about perfect fit. Something is up with my camera. Most of my pictures are coming out blurry like this. I think I will sit down with the manual and see if I can't figure out why all my pix are blurry. Lots of Christmas Day photos are blurry too. There Arose Such A Clatter...or was that a Thud? And the Clatter was me falling into bed with a THUD. I would have slept on dirty dishes I was so tired last night....oh that's right....it was 4am and that is yesterday now. (However it is 1:40 am....so I'm not thinking I'm doing much better tonight). We did wrap all the gifts....no bows however....that was just more than we could handle. So the gifts were partially naked. It pays to have IHAN at Christmas. We needed boxes of every size and shape....and I had them all...in the garage. I use recycled boxes so I keep them stacked in the garage. It was a breeze getting the right shapes and sizes but the wrapping was not such a breeze. I think I'll just use stickers next time. Perhaps "Priority Mail" stickers will come in green and red next year...LOL. Zach and Aaron sang carols last night and again today. They were so animated it was a great time. This morning Zach got so excited about his Christmas gift from Santa that he ran outside onto the front porch and screamed, "Thank You Santa....I love my present." So wonderful. The boys leave Santa and the reindeer cookies and carrots/celery. Santa leaves them gifts and letters. They boys just love the letters and seem so thrilled that Santa remembers things that they did this past summer. It is so fun to see their faces when I read them the letters. I'll post some pix soon....but as it is it is almost 2am on the 26th and I need to get some "beauty" rest. My definition of beauty rest is getting enough sleep so I can see the beauty in the day!!! I hope your day was wonderful and filled with gratitude. This is a picture of our house this Christmas Eve (total lie). We have had a wonderful day today. Some of our friends and neighbors came for a Christmas Open House today. It was a wonderful time. We wish you all a safe, loving and warm day filled with all the things in your life that make you feel deep gratitude! 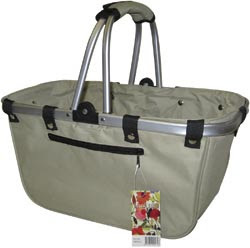 "This amazingly lightweight tote features aluminum exterior structure and is completely collapsible. 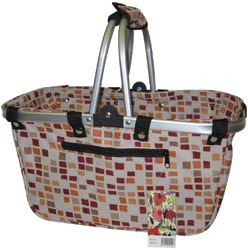 Originally designed as a market tote, it is also a super versatile project tote. The metal structure keeps access to goods inside immediate. 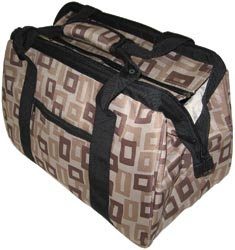 Made of durable nylon in great prints; self-fabric lined. Excellent quality. Exterior pocket." When I saw these....I could not resist. I have the small Red floral and the large Lime Green for my sorting station here at my desk. 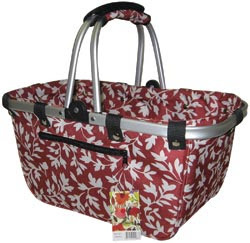 I remember carrying similar baskets when I went to the General Store as a kid with my Grandmother. The General Store was in Downtown Detroit somewhere and I remember the smell of the store and the wooden floors. They sold everything there....I loved going there as a kid with my Grandmother. Yes, I am running around like a chicken with my head separated from my body. That comes with the territory. These are my first IHAN holidays and I'm amazingly surviving and continue to enjoy the Holidays. Maddy, the youngest Jackson female :) is home from college for Christmas. Of course here youngest brother (they share the same birthday) is in "Love" with Maddy and quickly climbed right up on top of her shoulders yesterday upon arriving home from school. It is so much fun to see how the boys adore their sisters. Of course....it would not be a Jackson Household if some cards where not played. This was a game of Hand and Foot. Yesterday both of my co-workers had concerts at school. Grandma came down to watch the concerts too. Zach .....he had is moves down pat....it was so much fun watching the concerts. We are still maintaining our own here. Christmas cards may just turn into New Years Cards....because they are not in the mail yet....any surprises there? Ahhhhh.....this is the part I like the best.....the really bad stuff :) First you start out with several really pretty boxes that you have purchased 9 months ago for 25 cents each (new from a candy shop). Then you store them in all that extra space you have.....just move your stash over....or pile the boxes on top of the fabric....your choice. While you have your chocolate melting on low heat in a double boiler.....you put 24 oz of Jif Peanut Butter and 1 1/3 sticks of Imperial Margarine (softened) into the blender. Mix well. Then add as much powdered sugar as necessary to get it to a consistency to roll into balls. You might have to use your intuition here....guess....fly by the seat of your pants....what ever works for you. I use more than 16 oz and closer to 20 oz sometimes. Then, when your peanut butter mixture gets firm enough to roll into balls....you roll them up and place them on wax paper. With a toothpick, you poke into a ball and dip it into your melted chocolate. Carefully place it onto the wax paper or parchment paper lined pan. Take your finger and dip it into water and then you can smooth that little hole closed if you wish. When they get firm....do you know what you have? I had never had one until I moved to Ohio. I don't like peanut butter and chocolate together. My neighbor made them for us for Christmas the first year we lived here. To be polite I tried one. To my shock and surprise....I liked them. Should I have been grateful or really ticked? Who actually needs another really nasty thing to like? 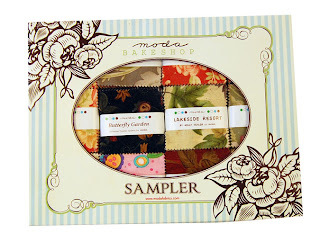 Sale Ends Soon....and does not apply to those new Dovo Scissors...yummy! It is not a rumor.....completely true!!! 25% off of the Suggested Retail on your total order. You MUST e-mail your order to IHAVEANOTION@yahoo.com in order to receive the discount. That includes all these wonderful products and more. Please keep in mind the first price on the website is the Suggested Retail Price....that is the price that the discount will be taken on. 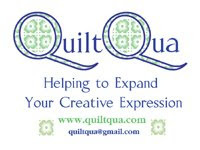 This offer does not include Electric Quilt 6 Software, AccuQuilt Go or The Thread Carousel. If you are interested in these products you must e-mail me for more information. When the sale is over.....it's over. I will not honor sale prices after the post on this blog indicating the sale is closed. All purchases over 100.00 receive a free gift from IHAN. Nothing big (No fancy sewing machines or new sewing studios...lol) but something fun I think you will like!! AND if that is not enough....if your order is over 100.00 you have the option of purchasing Alex Anderson's NEW 4 in 1 Essential Sewing Tool for only 12.00!!! Just tell me in your e-mail you would like me to add that to your order. PS...there is always a PS....some items are limited quantity and when they are gone .... they are gone. I'll do my best to keep everyone updated if I get close to running out of something wonderful. Little Green Men and XXXQQQMMM and Z too! 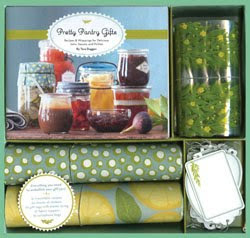 May Arts Ribbon Stocking....Check this out.